Admission: The garden is private but is open once per year with proceeds going to charity. The Genius of Gardening. Christopher Thacker. Weidenfield and Nicolson. London 1994. ISBN 0297833545. p 313. JGarden Description: Herbert Cooke (1865-1937) began developing this 6-acre garden in 1905 after a visit to he made to Japan in that year. Japanese garden features were imported and the design was developed over the following 30 years. In 1923, Japanese designer Kusumoto Seyemon was engaged to complete the design, incorporated a lake, streams, cascades, stone work, buildings, gates and arches with maples, azaleas, wisteria, bamboo, iris on dwarf conifers. Kusumoto worked periodically over the next three years. 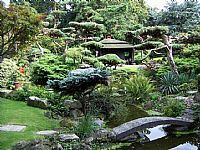 The Japanese-style garden still occupies 2.5 hectares with additional ornamental garden and woodland of 2 hectares. The house is on the English Heritage Register (GD1545). Herbert Cooke. The Japanese Garden at Cottered, Herts 1905-1933. 1933.